When you move to South Africa, it is easy to constantly compare South Africa with your old home, and to moan about being separated from North American (insert: where you used to live) comforts. Your conversations with yourself and others can easily revolve around the challenges of slow internet, your fears about crime, the stark inequality in the country, the lack of walkable neighbourhoods, the car dependency, the painful bureaucracy. If your attitude is one of continual comparing and contrasting, there is no lack of negative topics that can and will occupy your thoughts. The danger in such a lens however, is that instead of observing and learning from the place in which you now live, you allow your comforts and discomforts to become the focus of your reflections. Instead of thinking about ways to contribute, you seek to replicate or better your life in your old home and to find spaces that make you comfortable. As a result, the beauty, character, soul, heartbreaks, and stories of your new home remain invisible to you. Your inward focus makes you a poor traveler because the history of the place and the context of the gaps and differences you notice are not as important to you than the differences you mourn. The danger in having such singular vision is that if your time in a new place is a temporary experience, you may leave your expat experience unchanged by your travels. If your move is a more permanent one, you may never full settle into the curves of your new life. I am new to Joburg, and before and after I moved to South Africa I sought to find SA blogs from other North Americans for perspectives on the experience of adjusting to a new country. I thought hearing about the experiences of people from the same place that I am from (whether from Canada or North America more broadly) would give me a better understanding of what my own transition period might look like. I was not happy with what I found however, and by and large, I found descriptions that were insular, fearful, and divorced from broader historical contexts. In my reading, it was easy to find expats that limited what they experienced in Joburg to spaces which felt like “the West” instead of exploring neighbourhoods and areas that offered new spaces and ways of being to learn from. While I don’t think my reflections have been quite so panicky as the blog posts I read, my reactions to and feelings about Joburg change constantly. I miss a great deal about Canada (the amazing libraries and the luxury of library computer catalogue systems for example are privileges I now realize are not to be taken for granted) and there are days where homesickness overwhelms me, but there is also much I love and admire about my new home and that I am learning in my new environment. Before Joburg, I’d never been in a place where the pharmacist knows my name and the wider family I’m from, where local economies exist on a whole other level, where it feels like I have ample religious space, where I am not stressed about Islamophobia/wearing the hijab or where I feel comfortable enough to wear shalwar kameezes on a near daily basis. My ability and feelings about being far from Canada changes constantly, but I am blessed to have a partner who is South African and a whole South African extended family with whom I can have conversations about Joburg that give me a bit more context about my new home. We talk about how South Africa’s spatial development has been impacted by its history, and about its challenges, and there is so much to take in. As I learn, I want to balance out the conversations I have where I talk about homesickness and work visas and little else, with stories about my learnings and reflections on Joburg as I become more familiar with the city. As I discover unexpected gems I want to describe the places that have surprised me with their charm and beauty. To start: Here are two places that I’ve come across recently in Melville, (admittedly, a very hipster, yuppie area of the city) with restaurants and shops that I’ve thoroughly enjoyed getting to know a bit better recently. 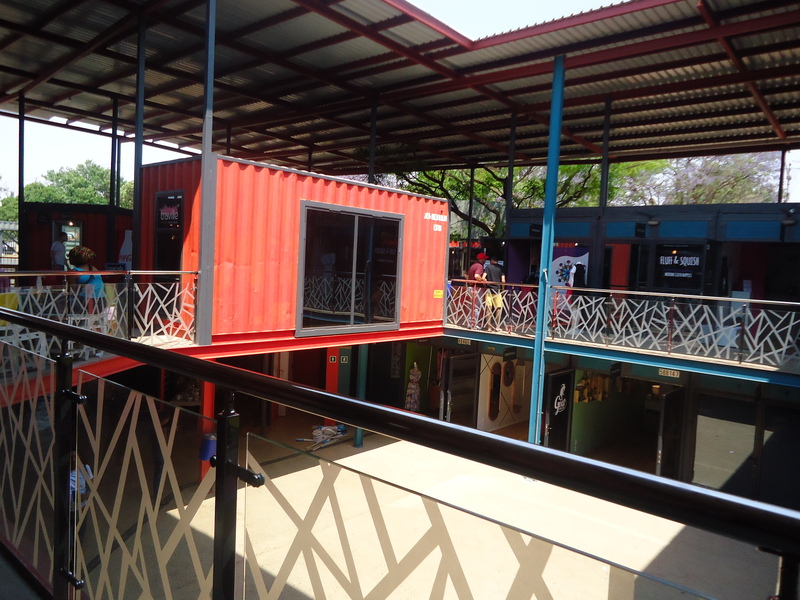 27 Boxes is a outdoor shopping centre where all the stores are made of out of repurposed shipping containers connected by walkways and open space. The stores range from a bookstore to a cronut and juice place, to an icecream place, to a masala chips store, to a waffles place, to a store entirely devoted to cloth diapers, to art stores, to much more. Though very different from shopping centres I’ve seen in South Africa or elsewhere the development reminded me a bit of a project I saw a few years ago in Toronto near the Scadding Court Community Centre that had shops in shipping containers on Dundas Street West that sold items from bubble tea to artisanal cheese. Those shops were primarily run by immigrants to the city of Toronto, and when speaking at a TEDx Toronto Salon called “The Immigrant” , Councilor Adam Vaughn called the project an innovative way to support the economic development of immigrant families in meaningful dignified ways, and reminded attendees that planning rules should be rules and guidelines that serve the development of the city’s residents. I’m not sure of the identity of shopowners of stores in the 27 Boxes development, but I very much liked the feel of the space. 2. The second spot is Bambanani, a family restaurant in Melville that simply has the most stunning playplaces I’ve ever seen. The restaurant solves a question that I imagine a lot of young families ask themselves: where is a nice place where we can eat, and our kids will enjoy themselves too? Bambanani is definitely one answer to that question. It is bright, stylish, has excellent food, and far from being an add on or frowned at for being there, children are the central guests of the restaurant. 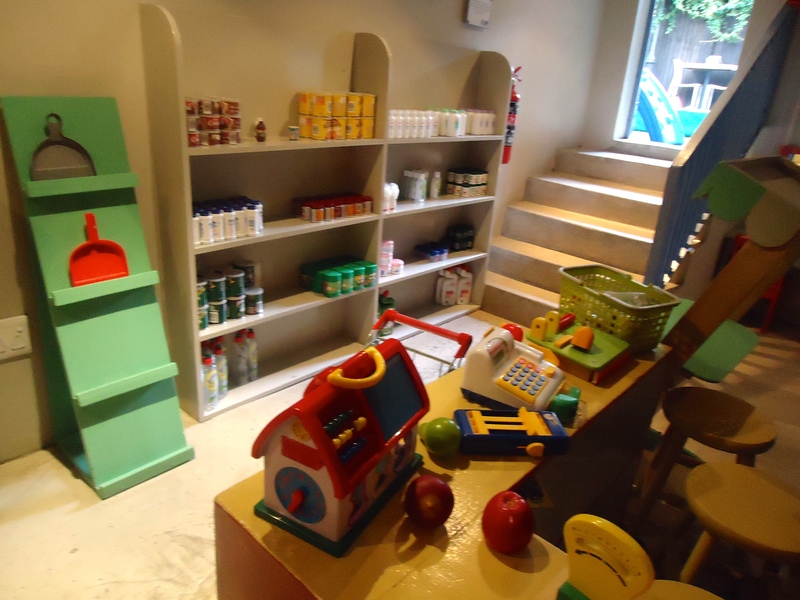 There are beautiful dollhouses and toys throughout, beautiful decor, a books and media room for older children, weekly classes, an outdoor shaded play area with childminders to help supervise and entertain your kids, and my personal favourite, a little grocery store (featured above) where children can go and pretend to shop. There is a little ironing board, a little kitchen and stove, produce and other ingredients, and everything else that you could imagine you might need on a pretend shopping trip. I’m not sure I even saw all the child-friendly aspects to the restaurant, but I will definitely be suggesting it to others and visiting again to discover more. I hope you’re able to feel relaxed enough to wear shalwar kameez soon. It is nice to be comfortable, especially when you’ve just moved to a new place. It is for sure! I wear them nearly everyday in Joburg. Wonderful read. Going through a similar thought transition here in London but in a very different context. I sent emailed you a BBC Doc podcast on a South Africa series they did. Should be beneficial to your transition. Miss you a lot and hope to see you soon inshAllah! Salaam Aisha! So glad that you liked the post, and I’d love to hear about your thoughts about the London move. Thanks for the email, will reply. 🙂 Miss you too and hope all is well!